Today DeWalt announced the brand new DWS780 12-inch sliding compound miter saw. The saw does look very similar to the older DW718 miters saw, and if you compare the two carefully you will notice that some parts are mirrored. I have had a few days of use with the older model saw, but it was years ago and I hardly remember if it had any design flaws. Because the saws are so similar looking, there were probably only minor changes made to the saw, but having not used the new DWS780 it is impossible to say for sure. The advantage of this DeWalt saw is its larger crosscutting capacity of 16-inches at 90 degrees. This is accomplished by using a sacrificial table and second built in fence. Not everyone needs a 16-inch capacity, but if you have ever installed closet shelving, you realize what an advantage it is. The second plus for this saw is its weight. People still like the cutting capacity of 12-inch miters saws, but like the weight of the smaller 10-inch saws. At 56-lbs the DeWalt has the other 12's beat. The number one new feature of the DWS780 appears to be their new LED shadow line system. 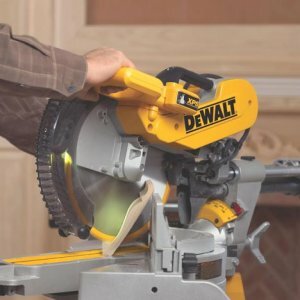 While other brand use laser lines to show where the blade will cut, DeWalt has come up with a system that uses the shadow of the blade to show where it will cut. So instead of having to adjust the laser after changing to a thicker/thinner blade, with the shadow system it doesn't even matter. The DWS780 12-Inch Sliding Compound Miter Saw is set to be released September 2011 and is expected to retail for $599. The Saw will come with a 3-year limited warranty, and 1-year free service contract. For the full specs and details check the press release below. TOWSON, Md. (June 1, 2011) – Today, DEWALT announces the launch of its new 12" Sliding Compound Miter Saw (DWS780), which has been designed to be precise and accurate enough for fine woodworking, yet durable enough for framing and deck building. The DWS780 is ideal for a variety of end users including cabinetmakers, trim carpenters, framers, installers and many other professional contractors who require a product that delivers the accuracy, capacity, durability, portability and ease-of-use that this saw offers. "Our end users frequently tell us that they turn to DEWALT miter saws because they can rely on them to get the job done over a long service life and with consistently accurate results," explained Rafe Bennett, product manager, DEWALT. "We're proud to hold this leadership position within the miter saw category, and we're confident that our new saw will not let contractors down." For visibility and accuracy when cutting, the new 12" Sliding Compound Miter Saw features the XPSTM LED light and cut alignment system that casts a laser-like shadow on the work surface, showing users where the blade will come in contact with the material. Since it does not require recalibration over time or when changing blades, this alignment system can be more accurate and durable than traditional laser guides. The saw's dual bevel system includes the ability to bevel right and left from 0 to 49 degrees with positive stops at 0, 22.5, 33.9, 45 and 49 degrees in both directions, as well as a high visibility bevel scale. The saw also miters 60 degrees to the right and 50 degrees to the left and features an adjustable stainless steel miter detent plate with 10 positive stops, allowing for fast and easy adjustments. A cam lock miter button allows users to lock angles between detents for versatility on the jobsite. The saw features a powerful 15 AMP motor that delivers 3,800 RPM. For convenience, the power cord is routed through the rail in the back, eliminating interference with the slide. Additionally, the saw offers an industry-leading combination of cut capacities, which includes 6-3/4 inch vertical capacity, 7-1/2 inch nested crown capacity, 13-7/8 inch horizontal capacity and exclusive back fence design that cuts up to a 2x16 at a 90 degree angle and 2x12 at a 45 degree angle. To simplify and maximize vertical cutting capacity, the unit includes a rail lock latch for holding the head away from the fence. The new saw's dust collection system collects over 75 percent of dust generated in the included bag. Additionally, to address two common user frustrations—portability and weight—the DWS780 has optimized its weight to just 56 pounds. It also incorporates ergonomic handgrips and folds to a compact package that makes transporting the unit easy. The saw's precision-machined aluminum construction ensures there is no sacrifice in accuracy or durability. The Sliding Compound Miter Saw will be available at home centers and independent distributors beginning in September 2011 and it is expected to retail for approximately $599. The product will come with a three-year limited warranty, one-year free service contract and 90-day money-back guarantee. There are a number of new accessories that are compatible with the product, including a variety of miter saw stands such as the Heavy Duty Miter Saw Stand (DWX723), the Compact Miter Saw Stand (DWX724), the Heavy Duty Work Stand (DWX725) and the Heavy Duty Work Stand with Miter Saw Mounting Brackets (DWX725B). For more information about the warranty or available accessories visit: http://dewalt.com/Home.aspx.